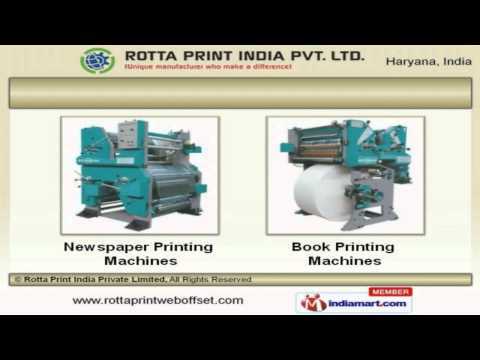 Welcome to Rotta Print India Private Limited, Manufacturer and Exporter of Web Offset and Printing Machines. The company was established in 2011 at Faridabad. Wide distribution network and Rich industry experience make us different from others. Assured quality products, Safe and timely delivery are the factors that help us to stay ahead of our competitors. We offer a wide array of Web Offset and Newspaper Web Offset Printing Machines. Our Newspaper and Book Printing Machines are superior in performance. We offer Book Publishing Machines and Pneumatic Reel Stands that are some of our best selling products. Plate Bender and Plate Punches and Hydraulic Trolleysa offered by us are best in the industry amongst others. Along with that we offer Repair and Maintenance Services that are reckoned all over the world for their superb quality. We also provide Printing Machine for Newspapers that are widely appreciated in the market.